The 2018 George Woodcock Lifetime Achievement Award, BC’s most prestigious literary honour, was presented to Lorna on June 28, 2018 in Vancouver. On this occasion, she was also inducted in the Vancouver Public Library’s Writers Walk of Fame. Read the article here. 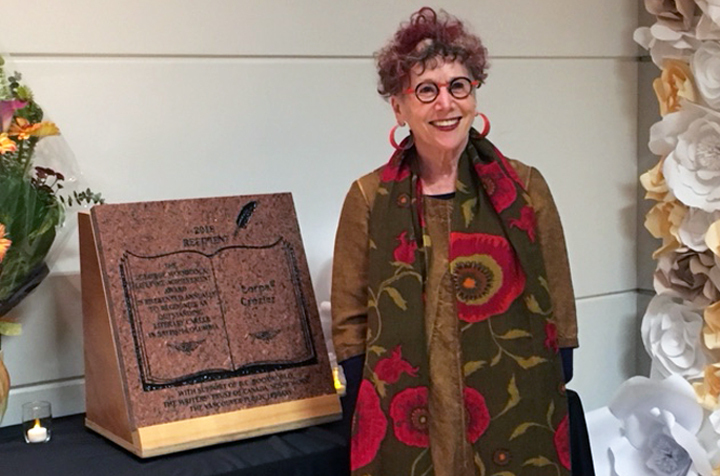 In March 2018, Lorna Crozier received the Chen Zi Ang Poetry Periodical International Poet Award in Sui Ning, China. Sui Ning is the birthplace of Chen Zi Ang, a famous Tang poet who rallied for unadorned, plain speaking in poetry. He was the precursor of Tu Fu and Li Po and had a tremendous influence on their work. The award is for a variety of my poems selected from different books and translated into Chinese. They appeared in China’s most prestigious magazine, Beijing’s Poetry Periodical, in 2017. The Wrong Cat was a double-winner at the 2016 League of Canadian Poets book awards. On June 18, this book received the Raymond Souster Award and the Pat Lowther Award. Read all the details on the LCP site. On June 11, 2015, Lorna Crozier received a degree of Doctor of Letters, honoris causa from Simon Fraser University. You can watch the video of the convocation and her address here. 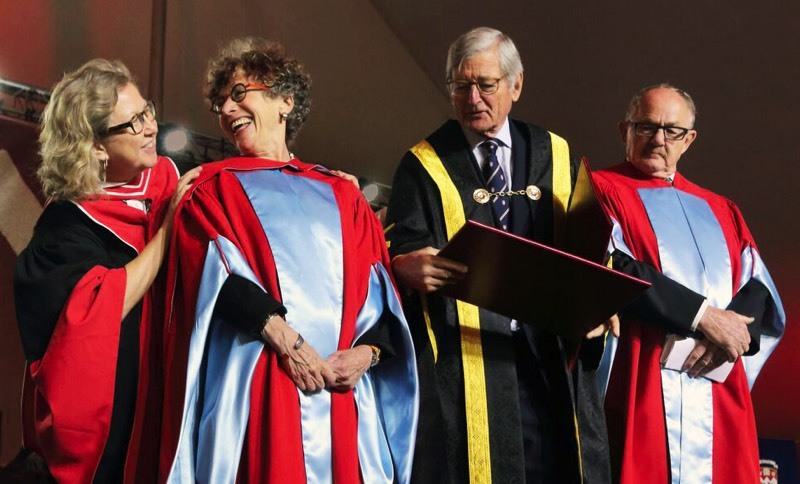 On June 1, 2015, Lorna Crozier and Patrick Lane received honorary degrees from McGill University. Their convocation address to graduating students was a poem, each stanza written by either Patrick or Lorna in response to the previous stanza. You can watch the video below, or on YouTube. Honorary doctorates conferred on Lorna and Patrick at McGill University on June 1, 2015. One of Canada’s most beloved and talented poets, Lorna Crozier has received numerous awards for her writing, including the 1992 Governor-General’s Award, the Canadian Author’s Association Award for Poetry and the League of Canadian Poet’s Pat Lowther Award for her collection Inventing the Hawk. In 1995, she once again won the Pat Lowther Award for Everything Arrives at the Light. Her other poetry awards include the Dorothy Livesay Prize for Poetry, the National Magazine Gold Medal and the first prize in the National CBC Literary Competition. Her memoir, Small Beneath the Sky, received BC’s Hubert Evans' Award for the best book of nonfiction in 2009. The Book of Marvels: A Compendium of Everyday Things was named one of the Globe and Mail's Top 100 Books of 2012. And Small Beneath the Sky was on Amazon’s list of the 100 books that must be read in one's lifetime. Lorna has been honoured for great distinction in both teaching and scholarly research in the academic community, receiving the University of Victoria’s 2004 Distinguished Professor's Award. That same year, the University of Regina presented her with an honourary Doctorate of Laws. In 2005, she was awarded a Distinguished Alumni Award from the University of Alberta in Edmonton. Four honorary doctorates have followed: one from the University of Saskatchewan in Saskatoon; one from Mt. Vincent University in Halifax; and most recently, ones from McGill University and Simon Fraser University. She was also inducted as a Fellow of the Royal Society of Canada and an Officer of the Order of Canada. In 2013 she was presented with the BC Lieutenant-Governor General's Lifetime Achievement Award and the Queen's Medal. The League of Canadian Poets made her a lifetime member for her outstanding work in poetry. Malaysia, Australia, France, England and in cities across Canada and the United States. High regard for Lorna’s poetry continues to garner her invitations to writing festivals around the world. In May of 1996 she was one of ten Canadian writers invited to represent the country at Les Belles Etrangeres hosted by France's Ministry of Culture and in May of 1997 and 1998 she attended the Poetry Africa Festival in Durban, South Africa. On May 19, 2005, as part of Saskatchewan’s Centennial Celebration, Lorna gave a command performance complete with orchestral and visual accompaniment, reciting a poem for Her Majesty Queen Elizabeth II. In 2011, Lorna received the Cheryl and Henry Kloppenburg Award for Literary Excellence, which recognizes the literary achievements of Saskatchewan writers. Part of the prize includes art by Saskatchewan artist Dorothy Knowles.